During the 'Cultural Revolution' Era (1966 AD - 1976 AD officially), all religions suffered, including the Islamic Faith. Depending on locality and activity and number of so-called 'Red Guards', many Islamic Communities suffered attacks, including on their Mosques. For instance, the city of Yinchuan in Ningxia Hui Autonomous Region, which had also become a model base for communist purists, saw all of its historic mosques destroyed or severely damaged. Of the three historic Mosques in the city of Yinchuan and vicinity only one survived, partially. Hundreds of other minor ones were demolished as well, as were Buddhist and Taoist temples and Christian Churches across the nation. (Read more in: 'History of Yinchuan' and 'Yinchuan Nanguan Mosque - Nanguan Qingzhen Si'). The situation was similar in another City with strong Islamic influnces, Lanzhou, the Capital of Gansu Province and important City for the Hui People, where in 1966 AD all of the city Mosques were removed. In this case, at least 14 Mosques were destroyed and the broken parts of the destroyed Mosques were even re-used for the construction of the large White Pagoda Hill Park (Baita Shan Gongyuan) which stands on a hill overlooking the Yellow River. In Ningxia only the Tongxin Mosque survived unscathed. In Gansu Province all Mosques between Tianshui and Dunhuang were destroyed, without a single exception. In the aftermath people, old objects, museum pieces and unique artifacts were destroyed on a large scale. The disastrous policies and terror of the Cultural Revolution continued until in 1968 AD the Army was finally forced to step in and restore some sort of order within the Nation. In requiring the aid of the Military, Mao inevitably had to rely on Lin Biao, who would then become Mao's officially named successor and the man behind The Throne. In 1971 AD, Mao eliminated Lin Biao, as no such large threat to his personal power could be tolerated by Mao. More on Ethnic Minorities of China and their Cultures: CLICK HERE ! After millenia of Feudal Rule ending in 1911 AD and the subsequent turbulent years of the Warlord-Era and the Anti-Japanese War combined with a brutal Civil War, the Chinese Communist Party and its Army arose victoriously. With the advent of The Peoples Republic of China created on October 1st of 1949 AD under the single-minded Leadership of Mao Zedong who can only be classified as a ruthless Communist Dictator, China and the Chinese would be changed forever. In the succeeding years Chinese Cultural Life would be transformed, religions and their followers persecuted, ethnic cultures destroyed and marginalized and much more. Altogether the reign of the Communist Party of China has been a difficult period for every religion within China, perhaps especially the Islamic Faith. China Ethno-Linguistic Map / Map distribution of Languages in China ! 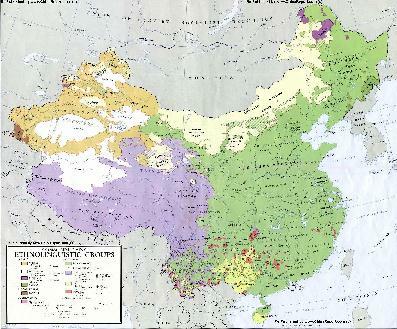 All Language Area's in China in 1960 AD, giving a fair idea of the ethnic minority communities dotting the provinces and autonomous regions of The Peoples Republic of China. took to the streets of the Capital Urumqi demanding 'justice'. The initially peaceful protest and march, soon turned violent and subsequently a rampaging mob of Uighurs attacked Han Chinese citizens and looted and burned down their stores. Many mobbed Hans were injured or worse, killed. In the immediate aftermath Police responded with new rounds of mass arrest and arbitrary detentions. During the Muslim Holy Month in September, local authorities enforced harsh laws through which Muslims were prevented their usual rituals of the Ramadan. Among things, Men were told to shave off their beards, women to were ordered to discard their facial vales and head scarfs, Muslim Restaurants were forced to remain open during fasting times upon threat of permanent closure and more. Police and Military infra-structure in the regions were further strengthened in the following months and years. In mid-January 2010, officials announced an increase in funding for regional security and pledged to crack down on Uighur separatists and the three forces of “terrorism, separatism and extremism”. At the end of January of 2010 Chinese authorities announced that an additional 5,000 special police officers (Armed Paramilitary Police) would be sent to Xinjiang-Uighur Autonomous Region to help prevent unrest and control possible separatists elements. More recently, in the year 1985 AD the Peoples Republic of China banned all Chinese Muslims from traveling to Mecca in order to perform the ritual 'Hadj', the official duty of each devout Muslim believer. This outright interference into their religious sphere left many Chinese Muslims dissatisfied and as a result tensions between Han and Chinese Muslims, both Hui and Uighur, only rose. It has been reported that eversince, there is a recurrence of Islamic sentiment in Ningxia Hui Autonomous Region and it is said that among the Hui in general, Orthodoxy is on the Rise. The Chinese Governments Ban on Hadj Pilgrimage has since been lifted. In the year 1997 AD, troubles were reported in Yining, known to Uighurs as Ghulja in Xinjiang-Uighur Autnomous Region. Although mostly unknown to the outside world tensions had already been stewing for some time over Uighur complaints that the Han migrants to their regions only came there only to steal jobs and the natural wealth of the Region. This was a complaint that the Uighurs had also legitimately tried to communicate to the Central Government through its representatives in the Peoples Consultative Conference and other channels. Traffic and pedestrians pass by at Dianwansi Mosque in Yinchuan, Ningxia Hui Autonomous Region. Dianwansi re-built in the 1980s is but one of the minor Mosques in Town. Although the nominally Nationalist Warlords the Ma's were defeated by Communist Armies in the second Ningxia Campaign in 1949 AD, this does not mean that every citizen in those regions warmly welcomed the undeniable coming of the Peoples Republic, in which all would be ruled by only one party - the Communists. Contrary to popular beliefs helped established by later Communist Propaganda tales, Mao Zedong nor the Communist Party were necessarily interested in being popular with the citizenry by the time of 1949 AD. The state of affairs within Communist Territories and within the Party by no means resembled a democracy. On the complete contrary, the whole affair was payed for and planned out by Moscow i.e. Joseph Stalin, with the added complication of a narcistic psychopath as Mao Zedong as ultimate leader who in fact corrupted the entire system to act according to his wishes, in the name of whatever, either Marxist-Leninism, Stalin, World Revolution or The Communist International. The only part that was not idle talk was the idea of world revolution. Page 414 of the Book 'Mao - the unknown story' by Jung Chang and Jon Halliday briefly mentions the existence of large groups or armies of armed Muslims resisting the Communist Revolution and Party Central Government in the regions of west China and the Gobi Desert in the year 1949 AD, after the establishment of the Peoples Republic of China on October the First. Not much can be told about these events as they happened in very far away remote regions, behind a screen of Russian and Chinese Communist censorship and away from any Foreign eyes, however it is clear that even after the official establishment of the Peoples Republic of China in Beijing on October first, (at least) more than one million armed men and women still roamed what is today considered Chinese territory, in strong opposition against the newly establishing Central Government. Among these were groups of Muslims in the West and far West, who had especially strong cavalry units who could make large problems for communist armies that far afield. The main reason why the world knows of this insurrection and opposition, is because it was specifically discussed in the first conversation Mao Zedong had with Joseph Stalin in Moscow (Dec. 1949 AD), conversations which were recorded and much later declassified. Mao came to ask Stalin for his blessing and for a lot of military and industrial aid. In the case of the internal Muslim rebels in West China, Stalin eagerly agreed to help Mao out with arms to annihilate them. According to the book the Muslim Rebels were dealt with mercilessly, their cavalry cut to pieces with soviet supplied airplanes and artillery, especially donated for the occasion by 'The Master' (as Mao called Stalin several times, although sly and dishonestly) Stalin. Stalin had his own reason for seeking influence in the regions as would be shown when continued Russian concessions in West (and North) China were demanded, and suppressing the Muslim Rebels was further helpful for full control on a wider regional scale. -The 1949/1950 AD violent suppression of Muslim Movements in West China is a well-guarded Communist Secret and information on it is sparse. The Issue is further under research by China Report Staff. What was taking over China was the strongest most ferocious political force in the nation which used every possible means to win dominance over that Nation. It was a total war, dubbed 'peoples war' by Mao Zedong, which involved the total mobilization of the population as well as the elimination (murder) of anyone who disagreed, or might be inclined to do so in the future. Hundreds of thousands died, far more than in the entire Civil War with the Nationalist side. 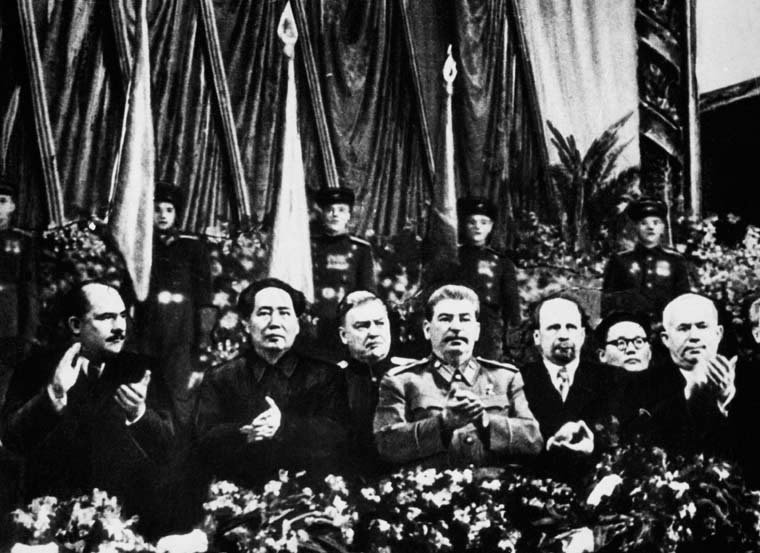 Mao Zedong present at Stalins 70Th Birthday in Moscow, December 1949 AD. It was the first meeting the two had, eventhough Mao had been working on Stalins orders for years. Nationalist Forces in the region turned the tide so powerfully against the Communist Side. 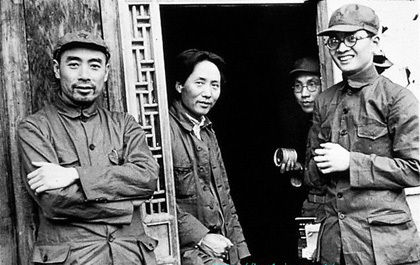 Mao Zedong, Zhou Enlai and Bo Gu in a photo from Yanan in 1936 AD After the take-over Mao, with the cooperation and full support of Zhou Enlai launched political campaign upon political campaign clensing away any opposition or independent thought thereby creating a truly Orwelian War State. laboratory for political techniques that would later be used throughout the Nation. Among the goals of the new administration; total secrecy - so no contact was allowed with the outside world, total control; - everything and everything had to be reported and discussed, plus approved by the higher leadership, and total obedience - the latter not given voluntarily in political agreement but forced upon each and every citizen by threat of severe physical harm, loss of status, punishment and almost imperatively by torture. There was to be no more public opinion, only group obedience. The only word was that of the party and the official faith was Marxism-Leninism, which however soon became the even vaguer 'Mao Zedong Thought'. The victims of the persecutions ran in the ten thousands, desertion if possible was high, and later when no escape was possible suicide was common. Logically, even though the Communist did their best to hide the truth for the outside world, those who had begotten the best knowledge of the true nature of the Communist Promise were the neighbors. Quite possibly, the predominantly Muslim peasants of these regions had seen and heard enough of the horrific persecutions, torture and cleansing that had gone along with the establishment of Mao Zedong's political dominance over the Ningxia-Hopei-Chahar border region to become completely opposed to such a state. 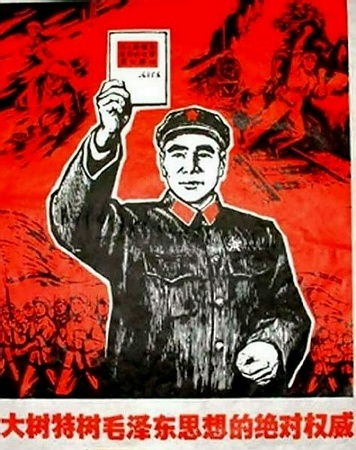 General and later Marshal Lin Biao on a Poster from the Cultural Revolution with Mao Zedongs' Red Book in Hand. The Slogan is even more pressing then before: 'Completely establish the authority of Mao Zedong thought', which meant that the Red Guards were fighting for total subordination to Mao Zedong only, whatever he thought of next. 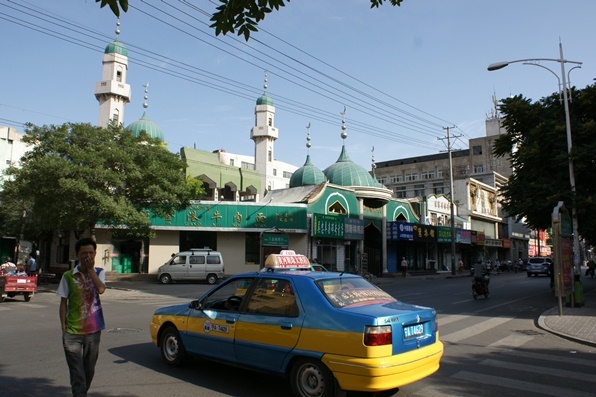 vicinity of the main (South Gate Mosque Nanguan Qingzhen Si) in Yinchuan, one will hardly find a drunk Hui Muslim. On the contrary, the community is very close knit with relatively few drop outs. 1958 AD. This however mostly applies to former Kuomintang troops which had escaped across the Southern Borders, from Yunnan Province into Burma (Myanmar), and who then re-attacked China with support from Taiwan and the United States secret intelligence agency (CIA). The Muslims in West-China, far away from any international contact or resupply did not last as long. A hint of their faith may be derived from books. Parallel to the anti-communist activities of Muslims in Ningxia, Gansu and Qinghai ran the Issue of Independence in pre-dominantly Uighur Xinjiang (New Territories). In 1944 AD, while the Civil War in China had officially been postponed but raged on regardless, the far western region of Xinjiang, which was largely disconnected from the rest of China and under heavy Soviet influence, had declared itself independent with strong support from the USSR. The so-called Republic of East Turkestan that was created mainly included what is known as the Ili Region of Xinjiang (Today roughly: Ili Kazakh Autonomous Region) and was intended by the local Uighurs and Kazakh's as an Islamic Republic which was to protect local ethnic cultures and ethnic groups from being overwhelmed by the Han Culture. 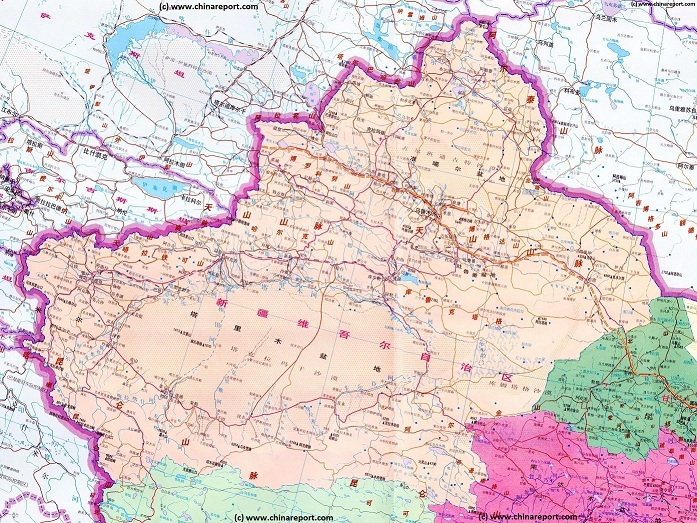 The Russians mainly intended to weaken the powers of the Kuomintang Central Government, with plans to later develop Xinjiang and other Regions for their own purposes. Although the secession was an affront to the Central Government, there was little it could do. In effect, it had to negotiate, which it did. Negotiations were partially successful as a shared Government construction was agreed upon and functioned briefly. However in 1947 AD, the Ili Peoples Leaders resigned and once again demanded full autonomy i.e. secession from China. The State remained in existence through 1948 when a new name was agreed upon: 'Democratic League for the Protection of Peace in Xinjiang'. Being opposed to the Central Government and looking for maneuvering space, the Turkestan Islamic Republic than made contacts with the Chinese Communist Party. Possibly lured with promises of Ethnic Autonomy within a later Chinese State, or at least ignoring the anti-religious philosophy of the Communist and anti-separatist expressions from no one less than Mao Zedong himself, the Xinjiang Muslims subsequently moved into further alliance with the Communist Party. Oddly, after the Communist Victory over the Kuomintang in Ningxia, Gansu and Qinghai, the Ili Government i.e. the entire East Turkestan Republic then surrendered fully to the Communist Party of China and its authority. It allowed full entrance to the Peoples Liberation Army and even agreed upon a program of full integration of its armies with those of the new Communist Republic. This was however by no means the true sentiment of the populace. Rather, the situation was brought about by careful coercion, intimidation and perhaps bribery of the right persons. Quite illustrative of what really went on is the following: The Ili Region leader selected to lead the Xinjiang (Ili) Delegation to the founding ceremony of The Peoples Republic of China on October the 1st of 1949 AD in Beijing was one Saifudin. Saifudin, was not one of the original Muslim leaders but rather one forced upon the Ili People by the Soviet Union which support it needed. Saifudin, not surprisingly was a loyal member of the Russian Communist Party and was thus likely a ComIntern Agent placed to control the Xinjiang Muslim Rebels. Not co-incidentally, another opposing delegation from Xinjiang, including more radical Leaders and secessionists, suffered an unfortunate plane-crash in which all members perished. Thus, the opposition conveniently did not make it to the Founding Ceremony of New China and by 1950 AD Saifudin had pledged loyalty to the Peoples Republic, had become a member of the Chinese Communist Party and became the First Governor of the newly created Xinjiang-Uighur Autonomous Region in 1955 AD. You Tube Video: The 1997 Uighur mass protest for Xinjiang Independence and the International Appearance of Rebiya Kadeer. affair then culminated into a peaceful mass protest for the Independence of Xinjiang counting 10's of thousands of excited Uighurs who took to the streets of Ghulja (I.e. Yining) on February the 5th of 2007. Confronted with this impressive sea of people marching on City Hall, Chinese Police and Military responded with force of arms. Police opened fire on the demonstrators after which slowly the crowds dispersed, leaving their dead and injured. Two more days of rioting followed in both cities, after which 1000's were arrested for their participation in the protests. At least 9 deaths were reported and confirmed by Chinese Authorities, and hundreds lay injured. Casualties are rumored to have been much higher. According to Amnesty International in 1997 at least 200 Uighurs were killed during the protests. To this day, the whereabouts of many Uighurs missing since those days have been let unexplained. At least 30 Uighurs, allegedly involved in violence and separatism in relation to the Ghulja Incident were been executed afterwards. Others received lengthy prison terms, including for life, for various crimes including 'hooliganism'. Larger and smaller tensions remain between Han and Hui ethnic groups, or between ethnic minority groups themselves. In the year 2004 the authorities in Henan Province were forced to place large parts of the Province under Martial Law as violent clashes between Hui's and Han's left at least 12 dead and many more injured. Currently (2010) there are problems and frictions between various ethnic groups in Qinghai Province where large parts of the nomadic population have been relocated in a Government scheme to preserve the ecology of the area. Climate change and overgrazing, combined with an influx of well educated Han migrants have combined into a situation of competition for land and rights, economic benefits and the like. No large incidents have been reported. Meanwhile, although apparently silenced discontent in Xinjiang simmered. Further aggravations for the Uighurs came in early 2009, when in a thinly veiled effort to eliminate threats of further uprisings, the Old Town of the millennia old City of Kashgar (Kashi) was bulldozed on orders of the local Government. One month after the conclusion of the riots, two bombs were placed on public buses in the Capital City of Xinjiang, Urumqi, killing another 9 and injuring and traumatizing 68. Although Uighur Separatists were blamed for the incidents by Chinese Media, no such proof has been given and the perpetrators of these crimes remain anonymous. Bombings were also reported from the National Capital Beijing. By the year 2000 AD the Central Chinese Government had officially announced the 'Go West' Policy, heavily subsidizing immigration of Han Peoples from coastal regions to the Western Regions including Xinjiang. Under the guise of economical development this created a new large influx of Han Chinese to previously Uighur dominated regions and has served to further increase tensions, anger and disagreement between the two population groups. An onfollowing crack-down on Muslim Opposition within Xinjiang has largely pacified the Xinjiang-Uighur Autonomous Region between the years 2000 and 2008 AD, although Chinese Authorities reported arrests and a few low level terrorist plots. As an early victim of the crackdown Uighur Leader Rebiya Kadeer was imprisoned for five years, after which she was released into exile in the United States in the year 2005. This nearly then year lull in apparent violence and disruption was among things due to actions of the United States Government which announced in October of 2002 that it was holding at least 12 Uyghurs at Guantanamo Bay Prison Facility in Cuba for possible connections with terrorist networks. Subsequently, the East Islamic Freedom Movement was declared a terrorist organization. This in turn facilitated a further harsh Chinese crackdown on what it was now able to label as 'terrorist suspects' within the Xinjiang Region (and beyond). small shops and trades of the Old Town and along with them the livelihoods of Old Town Uighurs have gone, sinking them into unemployment or retirement. Ostensibly done to rescue Uyghur residents from their unsafe homes in the Old Town community, no less than 220,000 Uighur Citizens were moved away from the center to a newly built apartment complex on the fringes of the City. Thus disowned from their meager belongings which happened to stand on now valuable land, the Uighur community was left with its heart ripped out. The obvious hope is that relocation and dispersion of the Uyghurs will break down their community efforts. China has spent a total of $448 million dollars as part of its plan to modernize the 'Old Town'. Although the arguments of city planners that the area has suffered from overcrowding, poor drainage, dangerous fire hazards, and has susceptibility to earthquakes appear legitimate, the deeper motives behind the mass move must be clear and likely have little outstanding with a sudden increased care for the problems of the Uighur community. You Tube Video: Aftermath 1997 Uighur mass protest in Xinjiang. Prohibitions for Ramadan. Tumbnail Map identifying the extends of Xinjiang-Uighur Autonomous Region as part of The peoples Republic of China. 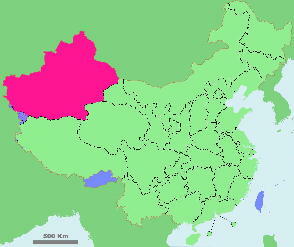 In total Xinjiang makes up about 1/6 of the total land surface area of the Nation. Between 1950 and 1954 AD the Communist Party of China conducted large-scale 'counter-revolutionary' campaigns as well as land reforms throughout Ili region and what is today Xinjiang-Uighur Autonomous Region as part of what was euphemistically called 'the peaceful unification with the motherland'. Among the main targets in otherwise impoverished Xinjiang were the religious leaders, who through their Islamic Church and status held 'large' land holdings. This was a tried and tested method used to eliminate the powers of any possible opposition members. As was the case throughout China, during this political re-education period large forced-labor and prison camps sprung up in the region. The Campaigns were considered to have been 'completed successfully' after which several Church Leaders who had been imprisoned and tortured as counter-revolutionaries were released. Immediately after their release some of these Men set to work on organizing armed resistance. The first renewed sign of Muslim came in the shape of the major the Khotan rising in Southern Xinjiang in 1954 AD, even before the establishment of Xinjiang as nominally autonomous region. In 1962 AD, after 10 hard years of cultural destruction, forced communization of otherwise nomadic people and other woes culminating in the 'Three Bitter Years of Famine', 60,000 Uyghur and Kazakh refugees fled northern Xinjiang into the Soviet Union in the hope for a better life there. It was one of the not so great events that occured as a result of the 'Great Chinese Famine' brought upon them by the political purges of the Great Leap Forward era and world ambitions of the Central Leadership. recognizing the widespread discontent that has surfaced throughout the region. Mass clashes involving Uighurs and Han in the regional capital of Urumqi in 2009 left around 200 people dead. In 2010 exiled Uighur leader Rebiya Kadeer was nominated for the Nobel Peace Prize, which however was awarded to another Chinese Dissident, Liu Xiaobo, who is currently imprisoned in Liaoning Province of North-Eastern China for calling for Democracy and developing a Document known as Charter 08. In the last four years since 2010 ethnic conflict, rioting and even attacks have been on the rise throughouth western and southern Xinjiang thus bringing Muslim People living in China into a very negative light. The reason for ethnic tensions and violent clashes between Han and the authorities on the one side, and Uighurs and other Muslim groups on the other side are complex and many. The main reasons however must be sought in the continuous repression of so called "Ethnic Minority Groups"; their language, culture, religion and entire way of life which is made worse by the mass migration of Han people from central Chiinese Provinces to the Xinjiang Uighur Autonomous Region. Where in the past Uighurs made up the largest population group within the East Turkestan, Ili and Dzungaria Territories (a.ka. Xinjiang) they are now outnumbered by Han Chinese. Or the put it more concretely; In 1949 at the beginning of the Peoples Republic of China virtually no Han lived in the Xinjiang Region, their number accounting for a paultry six per cent most of whom lived in the cities. This included the members of the Peoples Liberation Army. By contrast, today (2011 Census), Uighurs make up only 47 per cent of the population and Han Chinese 38 per cent, according to official Xinjiang State released figures. It is not surprising that the mass immagration of outsiders is leading to increased resource competition in which mostly, the original inhabitants loose out for clear and understandible reasons. In general resentment about the social, economic and physical marginalisation runs very high among Uighurs and other Ethnic Groups who feel powerless to act against the undoing. On the other hand, the Han do not trust the various ethnic groups, whereas the central Government has many times claimed that "Islamic Militants are plotting and executing a Holy War in "Xinjiang"". The Chinese Government usually blames some outside group and Foreign influence for the recurring carnage, more or less refusing ever to admit that perhaps the repression and marginalization of original inhabitants may be a cause for dissent itself. Thus, it seems the cycle of violence and repression seems set to continue. At the moment the National Security Apparatus is doing its best to intimidate the suspected "Islamic Terrorists" and security is high nationwide. Nevertheless, several high profile clashes between Han and Uighur (or others) have been recorded, and in the latest months no less than 2 important incidents have happened of which at least one was a major terrorist incident. A (dated) Goegraphic Map of Xinjiang-Uyghur Autonomous Region with its main population centers, roads and railroad, connections, airports, and main geographical features.